Garber Metrology provides calibration services on a wide range of electronic/electrical test and measuring equipment, as well as some electronic standards. Electronic calibration services are performed in our dedicated lab by military trained metrologists with an average of 17 years of experience. We provide regional pick-up/delivery service, and a five-day turnaround time on all equipment received at our facility. Electrical/electronic test and measuring equipment are often required and expected to deliver accurate and precise readings. However, like any other measuring tool, electronic test equipment must be calibrated regularly to ensure accurate readings. If equipment tolerances are left unattended, this can result in significant measurement errors. While these levels or drift can be minimized, they cannot be eliminated entirely. It is, therefore, essential that frequent calibration is performed on these devices. Maintaining a strict calibration schedule ensures that the equipment performs per its specifications, avoids inaccurate measurements, and guarantees repeatable results. All electronic equipment, no matter how precise, requires periodic calibration. The electronic calibration process essentially involves verifying, or adjusting the performance of a device that measures electrical parameters by comparing its output with known reference standards. Principal measurement parameters that are tested include (but are not necessarily limited to) current, voltage, inductance, resistance, time, and frequency. Electronic calibration is conducted using a set of highly precise and standard calibration equipment. This equipment must be aligned with and verified against primary measurement standards put forth by various relevant institutions for the particular application. Since these calibration instruments have thoroughly known and fixed performance characteristics, evaluation and adjustment of the units being tested are possible. 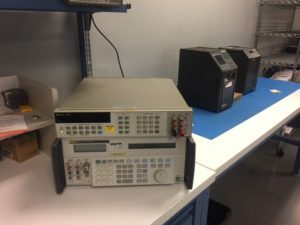 Performing electronic calibration on the test and measurement equipment itself, however, involves more than simply comparing the readings between two devices. Intricate and meticulous calibration processes and procedures for the given instrument must be followed by trained professionals. For sophisticated instruments, specific adjusters must be used in accordance with industry specifications to ensure the equipment is properly calibrated. Tolerances tend to vary slightly over time. For this reason, equipment calibration is an ongoing process. Only when an instrument is calibrated and used within its calibration period can the accuracy of its results be fully trusted. Once the calibration period of the device has been exceeded, the accuracy of the output result can no longer be guaranteed. For most electronic equipment, the calibration period ranges from six-to-twelve months. Garber Metrology’s electronic calibration services can be performed in our testing facility or on-site at your facility. Over 60% of our electronic calibration is currently performed in the field, so our metrologists are very experienced with a wide range of diverse work environments. Additionally, we are ISO 9001 compliant and ISO/IEC 17025 accredited with a strict quality assurance program that meets the specifications of ANSI/NCSL Z540-1. All calibrations are accompanied by Certificates of Calibration traceable to NIST. At Garber Metrology, our industry experts have calibrated electronic equipment for countless instruments in nearly every industry. Regardless of the application, our technical team will employ best practices to ensure your equipment is calibrated to the highest level of precision. To learn more about our calibration services and how they can benefit your industry, feel free to contact us.